Despite lacking two of their top players, the #18 Seward volleyball team dominated Cloud (25-12, 25-20, 25-15) in the Green House Wednesday night. 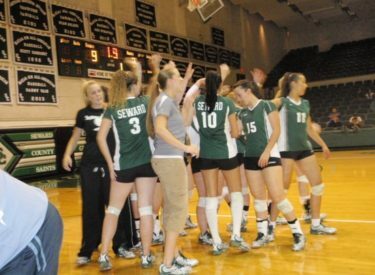 Seward won without injured Courtney Geesing and Daiane Souza. Souza (84) kills and Geesing (70) were second and third respectively on the team in kills behind only Sheina Fernandes (110). Seward is 8-2 overall and 2-0 in the Jayhawk West. They host 0-6 Garden City Saturday at 2 p.m. in the Green House. Here’s Wednesday’s NJCAA poll which ranks Seward #18.